Indian soldiers take great pride in the crease of their trousers, the twirl of their moustache and the shine on the metal and leather they wear. Arms, medals, epaulettes are all brought to the perfect shine before a parade. One key item of inspection is the glint on the ammunition boots. One enterprising regiment, the story goes, instead of using polish bought a box of Asian Paints paint and used it to good effect on the boots. Asian Paints managing director & CEO PM Murty doesn't know if it's a true story, though he joined the company way back in 1971. What he does know is that such small purchases can make the distinction between profit and loss, survival and extinction. Asian Paints has for long sold very small cans of paint which are used to colour the horns of bulls during the Pola festival in Maharashtra and the auspicious small red and yellow stripes at the bottom of the front door of Tamil Nadu homes. This might not always be remunerative, but it has given a tremendous boost to the company's brand recall. When the market is up, everybody makes money. But when the chips are down, only resilient brands stay afloat. Small efforts like this have made Asian Paints the leader in the Rs 7,500-crore (Rs 75-billion) per annum market for decorative paints with a market share of 50 per cent. (Companies make industrial and automotive paints also but those account for not more than a quarter of the overall market for paints in the country. These segments too have seen some improvement in sale of late.) In the last one year, Asian Paints has improved its share by about 400 basis points. 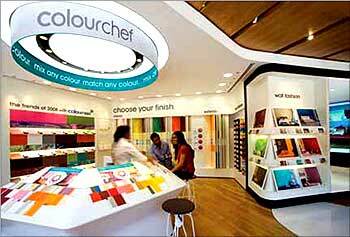 Rivals include Kansai Nerolac, Berger and ICI (Dulux and Velvet Touch). A dominating market share helps in many ways. A top executive of a North-based paints company says that Asian Paints has a competitive ratio of two (its market share, in other words, is more than twice its nearest rival), which gives it a huge advantage over others in purchase of raw material as well as distribution. "It can afford to participate in segments where the profit margins are not so good," says he. "It also uses it to leverage its position with the dealers." Not just did it grab a larger chunk of the market, Asian Paints also outperformed the industry by a sizeable margin in the quarter ended June 2009. Taking away share from rivals, Asian Paints' grew its sales 18 per cent, while industry revenues were up 12 per cent. That has happened in spite of the severe bind that the real estate sector finds itself in. Developers have decided to go slow on new projects as real estate buyers -- individuals as well as companies -- have turned cautious. Individuals too are not building homes at the same pace as before. 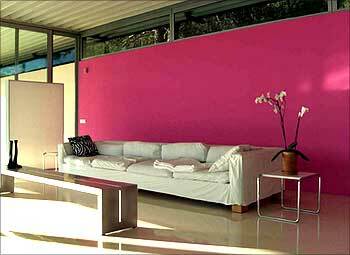 Most paint companies have an eye on the current festival season. If people paint their homes in large numbers, there is still a slim chance that they could reach last year's 18 per cent growth in sale revenue. Or else, they will have to settle for lesser growth. "The real test for us will be in the next two months," says ICI India director MR Rajaram. But Asian Paints looks on course for 20 per cent growth. What does it have that rivals don't? The trick, according to Murty, is to discover the right catchments, keep track of them and stay in close touch with the customer. What helped Asian Paints weather the slowdown, which was more pronounced in cities such as Mumbai, Bangalore but less so in Delhi, was the brisk business that it did in the more resilient economies of smaller cities and towns. Tapping its strong dealer network, the company was able to cash in the relative prosperity in these markets and take away share from competing brands. Most paint companies, mind you, are still dependent on urban markets for up to two-thirds of their sales. The economic slowdown has impacted towns and cities worse than villages. And this has dealt them a severe blow. For instance, ICI, now a part of Akzonobel of the Netherlands, grew just 7 per cent in the quarter ended June 2009. Others have fared little better. Asian Paints has turned conventional industry wisdom on its head. Its volume growth has been driven largely by Tier II and Tier III cities, which today fetch approximately 65 per cent of its revenues. Says The Boston Consulting Group Partner Abheek Singhi: "Even though the company has to deal with customers, dealers and painters in hundreds of cities and towns, it has done a good job of building relationships with all of them." The company was perhaps the first to realise that aspirations have risen in such markets because of the media over-reach and rising disposable incomes, and that consumers are no longer overawed by brands. With this in mind, Asian Paints positioned its Royale brand in such markets. Result? Royale sells as many cans in smaller towns as it does in metros, the premium image of the brand notwithstanding. PricewaterhouseCoopers leader (retail practice) N V Sivakumar says that Asian Paints has gained in the slowdown by offering good brands at competitive prices and across price points. Agrees Murty: "There are smaller construction firms which tend to look for less expensive brands at times like this. So even if the cost of distribution increases as you move down the value chain, we offer the products, though maybe in a limited range." The Asian Paints range has always retailed at a premium to the competition -- even today it commands an average premium of 5 to 10 per cent. But it is careful to see that volumes don't suffer. Judicious price increases have been taken when it needed to pass on the higher cost of inputs. For instance, when costs went up last year in the wake of soaring crude oil prices, the company raised prices 16.7 per cent, but spread it over six takes! And when the government cut excise duty to stimulate the economy, it dropped prices by about 12 per cent in five cuts. The planned phase-out of lead by 2012-13 is expected to raise the industry's costs by 3 to 4 per cent. Its sheer size, rivals feel, will give Asian Paints an edge over them. "We have never been reluctant to pass on the benefits of lower input costs and we don't believe in special rebates or promotions; we feel that everyday low prices work best," says Murty. Asian Paints President (Decoratives) KBS Anand says it doesn't make sense to cut prices too much because the competition inevitably follows suit. Also, the success of Royale in the smaller markets and the fact that that emulsions now sell more than distempers indicate that more customers are upgrading. In this scenario, a price war is hardly advisable. 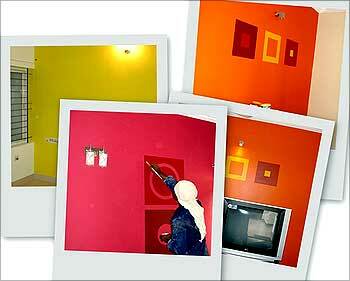 Asian Paints wants to make the most of the upgrade. And for this it is important that the customer interface with the brand improves. "The idea is to bring in more customers into the shops; old-style cramped hardware stores are no longer acceptable," says Murty. In a recent initiative, Asian Paints has opened a 6,000-sq feet signature store in Bandra, an up-market Mumbai suburb, to show customers how a home can be done up. Incidentally, the place doesn't sell a single can of paint -- it is merely a meeting ground for customers and interior designers. Anand says the idea is to expose customers to new ideas and concepts that aren't always possible in a small store, most of which are packed with tins of paint and don't even have a wall free. 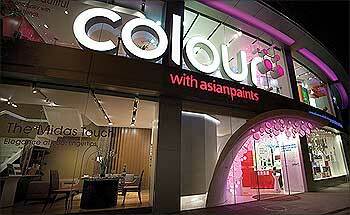 That apart, a brand new chain of smaller premium retail stores called "Colour Ideas" has been rolled out. At least a dozen stores should be open by the end of the year; these are what Murty calls "a slice of our signature store." Again, the idea is to provide the consumer with the right ambience in which to check out all the options and get some advice, especially since not all dealers have the resources or time to educate customers. 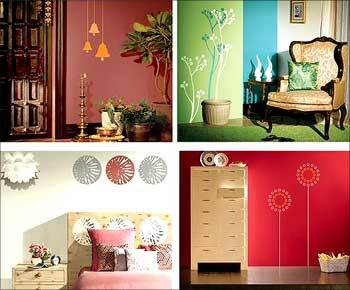 Of late, Asian Paints has made quite a splash of its samplers. "They cost just Rs 60 for 200 ml but help buyers visualise much better what the wall would really look like so that they're not disappointed later," explains Murty. With all this, the business has become far less seasonal in the metros. Then there are initiatives on the company's website from chatting with interior decorators to checking out options for colours and buying books. Asian Paints also connects with customers through the Home Solutions initiative -- a home-painting service which was started in 2000. The service is used by almost 20,000 homes every year. 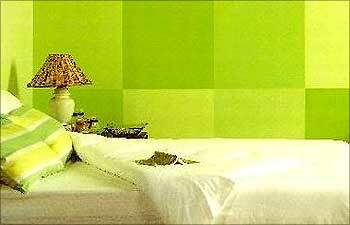 Asian Paints has several decorative paint brands. For exteriors, there are Apex, Ultima and Duracast. For interior distempers, there are Tractor and Utsav. In emulsions and enamels, its flagship is Royale. Given that consumers are moving up the value chain, Royale is Asian Paints' passport to success. In the early part of the decade, Asian Paints was not the leader in the premium space -- the spot belonged to ICI's Velvet Touch. The company felt it needed to create a campaign that positioned Royale as a lifestyle brand and if that meant spending more and using a star, it should be done. That is when it signed on film star Saif Ali Khan. "We felt a star would lend aspirational quality to the brand and it seems to have worked well because we are now the leader in the premium space," says Anand. In the process, Royale, which started out as a sub-brand, is now a full-fledged brand in itself. The benefits of aspirational positioning are paying off because spending power has increased; top-end products that fetch higher margins sell more than the products in the value-for-money range. Emulsions, for instance, are outselling distempers. In fact, Royale campaigns now don't even mention Asian Paints in the narrative. Asian Paints has never held back when it comes to promoting its brands and Murty says ad spends, as a share of sales, may even increase partly to deal with competition from new entrants such as Sherwin William and also because new launches require to be pushed. "We need to constantly remind the consumer of the brand," he says. Earlier in the decade, Asian Paints decided it needed a twin branding strategy and so it launched the umbrella brand through the Har ghar kuch kehta hai (Every home says something) campaign to build an emotional connect with consumers. The pull that the brands have created has made life that much easier for the company's 26,000 distributors, especially in the downturn. In 1998, the tinting machine made its advent in the paint market, which allowed customers to mix colours to get the particular shade they wanted. This changed forever the way business was done. BCG's Singhi points out that the tinting machine was a game changer because it made the supply chain so much more efficient. "Typically, fewer SKUs (stock-keeping units) mean less choice for the customer but tinting machines allow the dealers to hold far less inventory than they would otherwise need to offer customers a choice of 1,300 colours," he explains. Adds Anand: "The machines brought more customers into the shops, the dealers became more involved in the product and that increased the awareness about the brand." 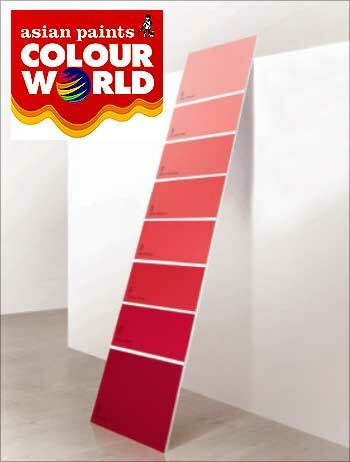 Today, more than half the dealer network of Asian Paints comprises Colour Worlds, as the shops with tinting machines are known. The company's plan is to convert the other half also over the next five years. PwCs Sivakumar says where Asian Paints scores over others is its ability to partner and hand-hold dealers: "It's not enough just to have dealers in place, it's as important to train them about new technologies and get them more involved." Anand says so much time is spent these days teaching dealers that when a new product is launched, there can be a six-month gap between the time it hits the market in Madurai and Jalandhar. Dealers are a key stakeholder in the company's business model. It, therefore, tries to ensure that dealers always make enough money they are eligible for price discounts, especially on cash purchases and during some seasons. The strategy is obviously working because otherwise the volumes wouldn't have come through. IDFC SSKI managing director Nikhil Vora says: "Asian Paints is not a lethargic leader. It has grown the market, innovated with delivery mechanisms and products, and virtually managed to insulate the business from downturns." This company clearly won't allow itself to be painted into a corner. Pranab the priest performs Puja!